< PREVIOUS High Arches and How to Fix Them | article | NEXT >Want a Successful Ankle Surgery Recovery? Don't Race Back to Training! Here is the typical appearance of the plantar fascia. Axial imaging is key to see the thickness and amount of medial to lateral involvement for procedure and surgery planning. Heel pain is one of the most common problems foot and ankle physicians encounter on a daily basis. Unfortunately, it is also a problem that plantar fasciitis is so common because many physicians do not consider that heel pain can be due to a multitude of problems, of which plantar fasciitis is only one. 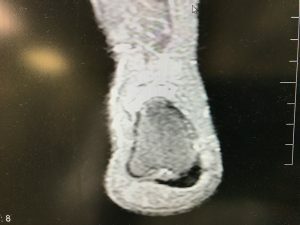 Radiographs, magnetic resonance imaging (MRI), ultrasound and computed tomography (CT) scans are among the imaging tools clinicians can utilize to discern different types of heel pain. But which imaging tool can provide the best clinical picture of plantar fasciitis, calcaneal stress fractures, calcaneal bursitis and other causes of heel pain. Over the past 20 years, I have seen heel pain due to almost every reason imaginable. Often, the patient is seeing me for a second opinion and the primary treating doctor, whether he or she is a primary care doctor or a foot and ankle specialist, has done no form of imaging, and has relied purely on history and physical examination for the diagnosis. Although we can understand a great deal from the history and physical, diagnostic imaging is a third tool that can build a more detailed picture, and allow for a far more complete diagnosis. Furthermore, in order to consider the proper diagnostic imaging study to order, I will discuss the benefits of each form of diagnostic testing and then connect them with the aforementioned diagnoses. The most common diagnostic imaging for heel pain is a common radiograph. The main use of a radiograph is to check for causes of heel pain not related to a soft tissue problem. These potential causes include a stress fracture or a bone cyst. One can sometimes identify both of these problems on a standard radiograph of the heel. The three views I suggest considering for patients with heel pain are a lateral ankle/foot view, a calcaneal axial view and a medial oblique view of the foot. These views will allow the best imaging of the foot and ankle for the most common problems related to heel pain. I often will also take a contralateral foot lateral radiograph for comparison of foot alignment and heel composition of the two feet. Radiographs of the foot, especially the medial oblique view for a calcaneonavicular coalition and a calcaneal axial view for a subtalar coalition, are also excellent sources of information. The second form of diagnostic imaging that foot and ankle specialists commonly use is a diagnostic ultrasound. Multiple forms of ultrasound probes and differing qualities of machines are available. The use of ultrasound is not easy to master but diagnostic ultrasound is the best diagnostic imaging for heel pain overall. Diagnostic ultrasound is cheap, easily accessible, provides rapid diagnostic results and is dynamic in nature, allowing for movement of the foot and ankle while one performs the study. I suggest using a linear probe and a machine with musculoskeletal settings. Probe strength can vary from 7 mHz to 15 mHz for diagnostic purposes. The most common probe clinicians use is a 7 to 10 mHz probe. A thorough diagnostic study will include a check of the plantar fascia along its course and mainly at the heel attachment. Furthermore, one may be able to check the medial calcaneal nerve as it goes under the abductor muscle belly tunnel region. Inflammation of the muscle belly may also cause nerve pain and one can image this. Subsequent to imaging of the medial calcaneal nerve, one can check the tibial nerve region for a space occupying lesion or engorgement of the venous complex. Also image and check the posterior tibial tendon. A tear in the posterior tibial tendon can result in minor or major arch collapse, resulting in heel pain. The calcaneal bursa is also fairly easy to identify with diagnostic ultrasound. The bursa is plantar and further posterior than the plantar fascia region, and is more central in nature. Finally, ultrasound can help diagnose three other causes of heel pain. However, the person performing the testing must have a fairly advanced level of ultrasound knowledge and also truly know the imaging requirements to find the more complex issues such as a coalition, stress fracture or bone cyst. I do not recommend ultrasound as the primary diagnostic tool if one is considering these three problems as there are better imaging studies that will offer better diagnostic assistance. 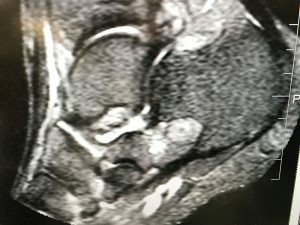 Computerized tomography (CT) is not a common tool for the diagnosis of heel pain as magnetic resonance imaging (MRI) utilization is far more common. However, CT scans do have a place in the diagnosis of heel pain. If one considers a fracture or coalition as highly likely, a CT scan can help diagnose a true fracture or an osseous coalition. That said, MRI can also help with diagnosing those conditions. Magnetic resonance imaging is the most comprehensive test for the diagnosis of heel pain in all of its different forms. An MRI of the ankle/heel can provide further illumination for the entire list of common heel pain differential diagnoses. One should perform MRI with emphasis on the ankle and heel instead of the rest of the foot because the majority of regions that require attention are in the heel area. My suggestion is to concentrate not only on the heel but the other regions of the ankle such as the ankle ligaments, the posterior tibial tendon, the subtalar joint and calcaneonavicular region as well as the Achilles insertion, which may cause problems. Furthermore, the radiologist should also consider swelling of the medial ankle, the tarsal tunnel region and the abductor muscle belly region, which can show inflammation that results in medial calcaneal nerve and heel pain. It is rare for us to start with an MRI with contrast. Contrast dye is not often required in a diagnosis of pathology about the ankle but may be beneficial in cases of a tumor. In these cases, order a second MRI with contrast. 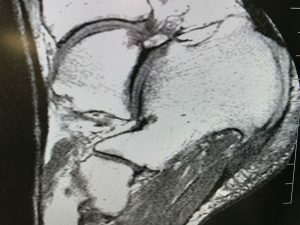 At times, an MRI with contrast injected into a joint may reveal chondral damage within a joint if one suspects this but this is also rarely required as a primary examination. In order to assist with the proper workup of each condition from an imaging standpoint, I will try and break down each diagnosis into findings and tests ordered. Here one can see a partial tear with significant scar formation and fasciopathy of the plantar fascia insertion. It is important to assess the amount of scar formation versus tear for procedure planning. The plantar fascia is the most common source of heel pain. It is important to consider the information presented with true plantar fasciitis, which is heel pain in the medial calcaneal tubercle region that improves with time and after a few steps. The pain may increase with standing and walking. While the pain is often not severe, it returns with a period of rest and then standing again, at which point the fascia again stretches. Standard radiographs are of little help in the diagnosis of plantar fasciitis but one should take radiographs on the initial visit in order to rule out other conditions. Often physicians utilize diagnostic ultrasound as the primary diagnostic tool in plantar fasciitis cases and ultrasound is very helpful to diagnose plantar fascia issues. The ultrasound exam is excellent because one can dynamically move the affected region during the exam to show what the fascia does during rest versus stretching of the foot, which simulates standing and walking. Physicians also often utilize ultrasound during heel injections to make sure they place the injection in the most troubled and damaged region. The mainstay of plantar fascia diagnostic imaging remains MRI. This is not because MRI gives the most details as a quality ultrasound provides far greater detail and information about the fascia fibers but MRI does give more detail about the overall image of the heel region. For instance, many cases of plantar fasciitis are due to lateral ankle instability. In cases of an unstable ankle, the peroneal tendons may spasm to support the ankle. This causes pronation of the foot, resulting in stress on the medial heel and arch, and subsequent plantar fasciitis. Although one can test ankle instability with examination of the ankle, the best imaging of the ankle ligaments and peroneal tendon region is MRI. A second example would be flatfoot with associated plantar fasciitis. In such a case, the posterior tibial tendon may be damaged or torn. A diagnostic ultrasound can be useful to check the posterior tibial tendon also but overall, the best and most diagnostic information about the medial ankle ligaments, tendon and joints come as a result of an MRI study. That said, a quality ultrasound and a quality ultrasound imager and reader can give you more information with a dynamic exam through ultrasound than with an MRI, which is static. Therefore, for a quality workup of the plantar fascia and possible associated injuries, a combination of ultrasound as a primary exam and an MRI as a subsequent exam may be the best approach. Baxter’s nerve entrapment is a very tough problem to diagnose and image. Often, the physician makes the diagnosis mainly by performing a physical exam and obtaining a history from the patient. Baxter’s nerve issues don’t always stand alone and may also be associated with plantar fasciitis. Patients with Baxter’s nerve entrapment may have burning pain, mainly in the heel region, which gets worse with continued standing and walking, and may extend to the lateral side of the heel from the medial side. The exam will reveal pain over the medial heel region more than the plantar heel region. With pressure on the abductor muscle belly region, there is pain in the heel region. The imaging approach with Baxter’s nerve entrapment is similar to what one would do with imaging for plantar fasciitis. Often one can use an ultrasound for both imaging of the nerve and the abductor muscle belly region. Diagnostic injection of the nerve is best with ultrasound guidance to make sure one injects the actual nerve. Podiatrists can use MRI for Baxter’s nerve problems but this requires a very strong foot and ankle radiologist to know what to look for. Tarsal tunnel is similar to Baxter’s nerve in diagnostic imaging. Often, the problem one is looking at is a space occupying lesion or mass in the tarsal tunnel. In some cases, there may be an enlarged venous plexus. Magnetic resonance imaging and ultrasound are both good for such examinations. Computed tomography is preferable in cases of a loose body which, if present for an extended time, may be difficult to note on MRI due to the lack of edema or signal. Plantar fibroma formation in the region of the medial heel will cause very similar symptoms to plantar fasciitis. It also may cause either Baxter’s nerve and tarsal tunnel issues, or both, depending on the location of the fibroma. If the fibroma is proximal and near the insertion site, the pain can be more related to the heel and Baxter’s nerve. If the fibroma is more proximal to the arch area, the pain is more tarsal tunnel and plantar fasciitis in presentation. Ultrasound and MRI are both excellent for imaging of the fibroma region. Since the tissue is fascia in nature, the imaging is directly similar to imaging of the plantar fascia and fasciitis. However, diagnostic ultrasound can give greater details of the fibroma size, depth and location than MRI as it is more hands-on during the examination. A radiologist may also read the fibroma as a thickening of the plantar fascia causing the foot and ankle specialist to consider the problem to be fasciitis if he or she doesn’t personally review the MRI. Therefore, I suggest ultrasound of a suspected fibroma by the foot and ankle specialist as a primary examination if the problem is a suspected fibroma. Physicians often suspect a stress fracture of the heel prior to diagnostic imaging and, at times, one can diagnose this with a plain radiograph. On history and physical, the presenting symptoms include pain that is worse with increased or continued activity. On examination, there is also pain with a medial and lateral squeeze of the heel, which is rare with plantar fasciitis. Furthermore, there is a possible increase in pain with a tuning fork exam of the heel. Imaging is best with MRI in a case of a suspected heel stress fracture. This is due to the fact that the edema from the stress fracture can be just as problematic as the actual stress fracture itself and MRI is by far the best imaging of edema. Note that a stress fracture of the actual heel spur associated with the plantar fascia insertion can be a source of pain unrelated but often confused as plantar fasciitis. In such cases, an MRI will show edema and possibly the actual stress fracture of the plantar heel spur. Note that in many cases, if the heel spur fracture is the main source of the pain, the plantar fascia itself will not show a great deal of edema or swelling, and the main edema will be at the heel spur region. On ultrasound, take care to consider patients with classic plantar fasciitis pain who do not have thickening of the plantar fascia as having a potential heel spur fracture. Ultrasound can show a heel spur fracture but is not commonly in use and not easy to use for a true calcaneal stress fracture. This fat suppression image shows what had initially been diagnosed as plantar fasciitis actually being pain due to a calcaneal cyst in the anterior body of the calcaneus. Even though the majority of bone cysts clinicians identify are benign, it is important to have a musculoskeletal radiologist review images in order to give recommendations for further studies or testing if there is concern of a malignancy. Common bone cysts are aneurysmal or unicameral in nature. Intraosseous lipomas are also common. Benign lesions have softer edges and smooth borders while malignant masses have jagged edges because of their more rapid growth. Radiographs will often show a shadow of a mass in the heel region with what will appear to be a less dense region of bone. Magnetic resonance imaging is the best form of testing for lesions of the heel and will show the mass in greater detail. Often, the physician will do a study with and without contrast if there is fear of a malignancy as the study will offer the radiologist greater information about the mass. Calcaneal bursa inflammation is a far more common problem than we often consider. Many patients diagnosed with heel pain due to plantar fasciitis actually have a calcaneal bursa inflammation as the cause of pain. Radiographs may show an increase in the density of the heel region that is commonly visible with an inflamed bursa although weightbearing images may make this more difficult to see. Diagnostic ultrasound can be very useful for identification and injection of the bursa region. Due to its dynamic nature, ultrasound allows for movement of the region and the ultrasound probe, which allows better visualization of the region while the patient is present. An MRI is also useful in diagnosis of an inflamed bursa and will often show the bursa region well. Overall, for calcaneal bursa inflammation, I have found that an ultrasound exam has been excellent for differentiating bursa versus fascia problems and allows for better treatment of the patient with proper injection of the region during the examination should the patient require such treatment. What Is The Most Effective Imaging Tool For Calcaneonavicular Or Subtalar Coalition? Coalitions are a cause of heel pain that we often do not consider. In such cases, the heel may be in an abnormal position of pronation or the pain from the coalition region may cause a peroneal spasming that results in a pronated foot position. This pronation results in increased pressure on the medial heel region and subsequent plantar fasciitis. In such cases, although the heel pain is secondary to the primary coalition issue, understanding the actual cause of the heel pain as due to the coalition is important for proper care of the patient. Radiographs are often able to facilitate the diagnosis of an osseous coalition. In the case of a calcaneonavicular coalition, a medial oblique view of the foot will show an osseous bridge. For optimal visualization of subtalar coalitions, clinicians should combine a lateral radiograph and a calcaneal axial film, which will show an osseous coalition of the middle facet well. Often, a fibrous coalition may be present. In such cases, the radiographic imaging will not be clear. The physician can sometimes consider fibrous coalitions via radiographic imaging, which shows an abnormal increase in the bone size and shape in the region of coalition, and a “halo” sign around the subtalar joint due to the lack of motion from the coalition. Magnetic resonance imaging is the best imaging for coalitions and one can diagnose both a fibrous and osseous coalition with MRI. However, keep in mind that clinicians can miss fibrous coalitions if they don’t consider them in their differential diagnosis. Computed tomography scans are great for diagnosing the size and density of an osseous coalition as they give greater detail than MRI about the osseous region. However, an MRI is still the best overall imaging tool and one may use a CT as a secondary consideration in cases of surgical planning post-MRI study details. Posterior tibial tendon dysfunction (PTTD) can also result in a collapse of the arch, leading to heel pain. In such cases, the radiographic images will show a flatter foot position in comparison to the contralateral limb. Examination is often the best way to consider PTTD but confirmation of the level of the tear, amount of damage and surrounding structures such as the spring ligament are necessary considerations prior to surgical care or non-surgical consideration. Magnetic resonance imaging is still the mainstay of imaging for PTTD. An MRI will help with diagnosis of the plantar fascia damage as well as damage to the posterior tibial tendon, the spring ligament and the deltoid. Furthermore, one can visualize the underlying flexor tendons, which may also be involved in the foot pain due to overload and tendonitis. Diagnostic ultrasound in the proper hands of a well-versed technician or physician can also provide excellent information. The posterior tibial tendon is fairly easy to visualize as is the plantar fascia. One can identify regions of tear of damage to the posterior tibial tendon and dynamically test the pull of movement of the tendon during the ultrasound exam, which is of greater benefit than an MRI. Plantar fasciitis is the most common source of heel pain but one needs to consider all forms of heel pain in the proper care and workup of a patient. Imaging of the heel is also essential in the proper workup. Radiographic examination is useful for a primary source of detail but truly offers little assistance in imaging soft tissue. The mainstay of in-office imaging that is rapid, easy to perform and cost-effective is diagnostic ultrasound. With minimal training and some course work, one can use ultrasound to pick up much of the detailed information that MRI would reveal. Ultrasound-guided injections can allow for a more accurate placement of the medication in the region of inflammation and injury. Magnetic resonance imaging is the overall winner for the examination of heel pain as one can diagnose most problems with heel pain with an MRI. Multiple planes of examination and multiple sequences with each plane will afford greater detail and information. In rare cases, utilize an MRI for greater detail of a heel pain problem but MRI is often sufficient to pick up most of the information a CT scan reveals. Proper examination and diagnostic studies combined with a historical consideration of the symptoms will allow for rapid and cost-effective care of the patient, and decrease wrong diagnoses and treatment issues. 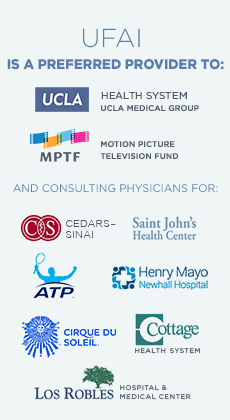 Dr. Baravarian is an Assistant Clinical Professor at the UCLA School of Medicine, and the Director and Fellowship Director at the University Foot and Ankle Institute in Los Angeles. Read the article on www.podiatrytoday.com. Next: Want a Successful Ankle Surgery Recovery? Don’t Race Back to Training!